It’s strange to me that Gremlins hasn’t been signed up to a belated sequel/reboot by Hollywood. The original was relatively well-received and was the fourth highest grossing film of 1984! The sequel is less talked about, but still, think about it. Gremlins has plenty of merchandise potential. It’s a bankable property based on nostalgia. Of course, they’d mess the franchise up by having the Gremlins in wonderful CGI. 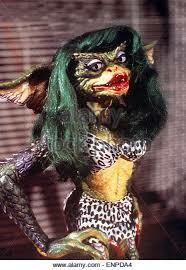 But as long as they didn’t make all the Gremlins female (I jest, of course! ), I’m sure Hollywood would have a hit on their hands. After recently watching Gremlins 2: The New Batch, I can almost see why Hollywood haven’t capitalised on the Gremlins franchise. It’s because Joe Dante created a crazy, insane sequel that defies description and defies most of the conventions of a sequel. How could anyone follow that? Gremlins 2: The New Batch is less talked about than the original, but I actually prefer the sequel. I love the original. But given a choice between the two, I’d choose to watch the sequel at least 60% of the time. Ostensibly, Gremlins 2 has all the basics of a typical sequel. It has the same premise as the original, in that Gremlins wreak havoc. But, of course, in the true style of a sequel, they don’t merely wreak havoc on a small town like in the original. They wreak havoc in a massive skyscraper in New York! Sequels always have to be bigger, don’t they? Billy (Zach Gilligan) and Kate (Phoebe Cates) are also part of the action…as are, for some reason, Murray and Sheila Futterman. However, right from the beginning, something doesn’t seem quite right with this sequel. The Loony Tunes opening card greets the audience. Bugs Bunny appears, but Daffy Duck steals the spotlight! Already, you’re on edge. What’s happening? Is it a short cartoon preceding the movie? It’s funny, but what is going on? The movie starts and takes a while to get going. That’s a criticism I have to level at Gremlins 2. Come on, we’ve seen the original. We know Gizmo is going to be doused in water and pop out some Gremlins. Why does it take so long? Another problem is that both the story and the humans are peripheral to the sequel. Billy and Kate are merely props for the craziness to happen. They exist, but aren’t sympathetic or engaging. Of course, we have Christopher Lee as a mad scientist, and John Glover as billionaire (and owner of the havoc-stricken skyscraper). They chew up the scenery with glee, bringing lots of smirks and laughs to our faces. But still, they’re nothing more than overwritten caricatures. We have no reason to care for them, or any other of the other characters. Comparing it to the original, there’s no central human character to create sympathy in the audience. Even Gizmo is given fairly short shrift here. We open with Gizmo watching Rambo (II or III? ), a little bit of foreshadowing. But he spends the majority of the film being tortured! Yes, the merchandise machine has his fur ripped out with Velcro, for example. It’s almost as if Joe Dante didn’t want to make this sequel and is killing his own creation. In a way, he is killing his own creation. He didn’t want to make the sequel, but Warner Bros promised him complete creative control and a budget triple that of the original. So what did he do with the control and money? Mock the original in every way possible, and mock the notion of a sequel! Clamp Tower runs its own cable shows, and one of them shows a film critic with a video of the original Gremlins in his hands. And what’s that? He’s tearing the film apart! Soon after, Gremlins drag him out of view. However, the critic is a real life film critic, Leonard Maitlin. He actually savaged the original Gremlins when it first came out. I love fourth-wall breaking and this is a particularly grand example of it. However, there’s an even better example of fourth-wall breaking later on in the film, which I won’t spoil for the uninitiated. There’s a love triangle…but who cares about that? There’s not just fourth wall breaking, but a delicious vein of satire and irony running throughout Gremlins 2. There are parodies of famous movie moments. When the Gremlins wreak havoc, it’s sublime to witness. These are not just normal Gremlins, either. Christopher Lee’s mad scientist laboratory opens up a whole new world of crazy Gremlin creations. A female Gremlin, a Gremlin made of pure electric, and a super-intelligent Gremlin are just a few examples of the creativity and madness at large in Gremlins 2. It may not be more than a series of gags, but when the gags are constantly funny, ridiculous and creative, it’s more than worth the watch. Gremlins 2 captures the anarchic wit and mayhem or a typical Bugs Bunny cartoon. The story and the characters are paper-thin, but at least Christopher Lee and John Glove make a great impression. But Gremlins 2 is all about turning the notion of a sequel on its head. So yes, it may be bigger than the original, but on every other level it pokes fun both at sequels and at the concepts of Gremlins itself (a group of people question Billy about eating after midnight, for example). It breaks the fourth wall, it constantly conjures up something crazy to behold and provides at least a laugh a minute. If you’re looking for a simple continuation of Gremlins, then this film won’t be for you. If you want something creative and crazy, then Gremlins 2 is for you. VERDICT: 7/10. Gremlins 2 isn’t your typical sequel. It’s not even your typical film. It doesn’t adhere to notions of story or character. It just gives us crazy situations and visuals for us to feast our eyes (and funny bones) on. Prepare to have the fourth wall smashed. 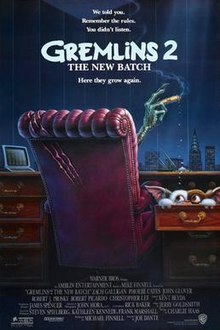 What did you think of Gremlins 2: The New Batch (1990)? Leave your thoughts/comments below! Honestly, I thought that the sequel was great fun too. Gremlins 2 was pretty great in it’s own right. I agree that it’s strange they haven’t remade this yet. There’s still plenty of time for them to remake it! True…I still see Gizmo toys popping up. Why not, right? It must be on the cards!